Textile technology is older than any other ancient craft and is an instance of cognitive archaeology that provides vital information about society. In ancient Greece, textiles were considered among the principal and most fundamental cultural expressions. Athena, the goddess of the city, of intelligence and of skill was also the patron goddess of weaving. She taught the craft of textile production to women thus making them conduits of civilisation. During Classical times, textile production was a fundamental part of the economy and was practised also by men in both the domestic and artisanal spheres. The resulting technological sophistication is reflected in depictions of discrete or elaborate patterns, in the rich diversity of textile implements and in the variety in the quality of the extant textiles. 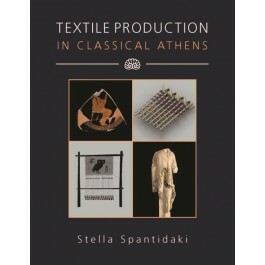 In Textile Production in Classical Athens Stella Spantidaki provides the first synthesis of the available evidence from textual, iconographic and archaeological sources on textile production in 5th and 4th century BC Athens, employing an interdisciplinary perspective that sets the frame for future research in the field. As such this study is of special importance for textile specialists, ancient history scholars, historians of technology and students and will lead to a better understanding of ancient Greek textile production and Classical Athenian society. Presents a detailed consideration of the historical and social context of textile production in classical Athens; Examines and discusses evidence for the equipment, materials, processes and techniques employed at each stage of the full production sequence; Discusses the organisation of production and trade. "…a rich and useful synthesis of our current knowledge of how cloth was created in Attica and the wider Greek world. Richly but usefully illustrated with many colour images (scenes from pots, sculpture, and, importantly, archaeological finds) and with numerous line drawings and charts, the large-formatted book also offers a comprehensive glossary of textile-related terms in Classical Greek literature. It will form a secure basis of fact and interpretation for all scholars and students interested in dress-related subjects."